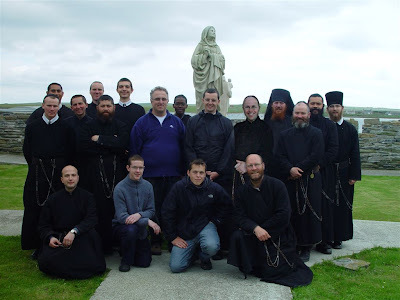 First Religious Profession of Br Roman Maria, C.SS.R. 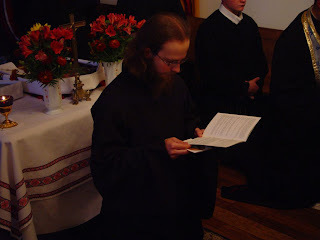 Rev Br Roman Maria of the Child Jesus and the Holy Face, C.SS.R. 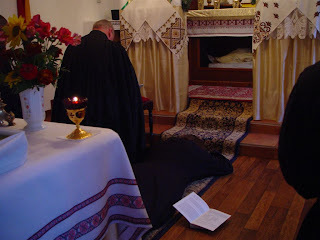 a Greek Catholic from Lviv, Ukraine, prostrates himself before Blessed Sacrament while Veni Creator Spiritus is sung. Rev Fr Michael Mary, C.SS.R. warnes young novice before such an important act of giving himself fully to God... "Until death, Father." Rev Fr Michael Mary, C.SS.R. 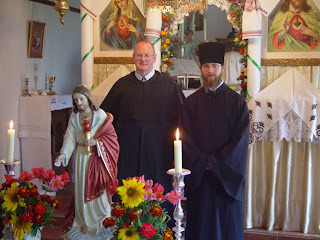 is pictured with newly professed Br Roman Maria, C.SS.R. before traditional Ukrainian icon stand, especially made for this occasion. 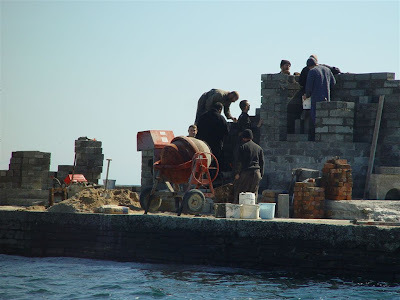 We have begun work on a wall for our pier. However, this will be no ordinary wall. It will have shrines running along the inside of it. The first will be for a statue of the Immaculate Conception. This is a long term project. Br. Xavier and Br. Paul Mary, C.SS.R. Br. Wolf Maria, C.SS.R. 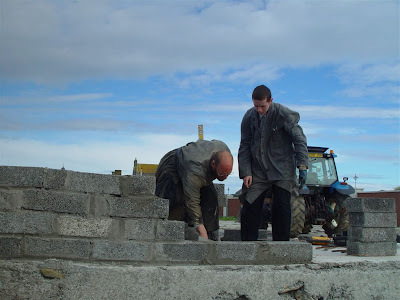 shows young Dominic Farrell how it's done. The arch is carefully lowered into place with the tractor. Fr. Michael Mary, C.SS.R. ensures that all is done for the glory of God and of His Holy Mother. Following on from the feast of our Holy Father, Saint Alphonsus, we would like to take this opportunity to announce the growth of our humble congregation, which now begins to spread its arms around the world. 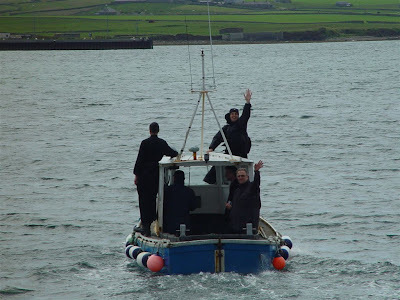 Indeed, we have chosen, a very northerly location for our Congregation, but this outpost of tradition on Papa Stronsay must now become a motherhouse, as we send our forces to the other side of the world, and south. For many years, since Rev. Fr Cummins, C.SS.R. stopped visiting, the South Island of New Zealand has been without the regular celebration of Holy Mass. In fact, until recently, the faithful there could receive the sacraments only once every two months. 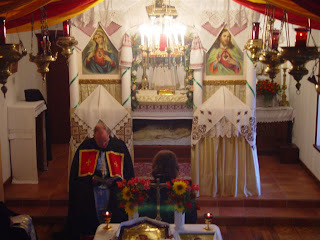 They now receive a visit from an SSPX priest once every month, but we must all agree that this is hardly satisfactory. 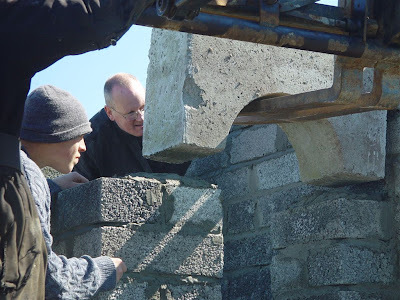 It is for this reason that we would like to make known the new foundation of Transalpine Redemptorists in the city of Christchurch, New Zealand. 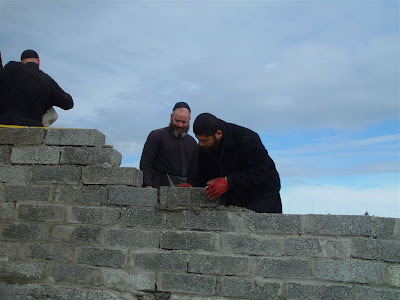 The properties for the church and monastery are in the final stages of changing hands, and with a little work, will be ready to receive the first Transalpine Redemptorist missionary priest, and two brothers, to serve the faithful traditional Catholics of the South Island of New Zealand. We hope that this news will bring you as much joy as it has brought us, and that it will bring great glory to God, and to our Holy Father, Saint Alphonsus, whose rule and congregation we are trying to preserve unsullied until the consummation of the world. Our Mother of Perpetual Succour, Our Holy Father Saint Alphonsus, and all the Saints of the Redemptorist Congregation, Pray for us. The site of the new foundation. The building to be the new Chuch is on the left, and the house is on the right. Rev. 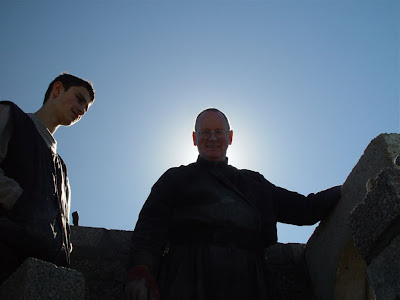 Fr Michael Mary, C.SS.R. enters bearing the statue of the Holy Infant of Prague. The first Holy Mass is celebrated inside. In the summer we often receive visits from our dear friends from different parts of the world. 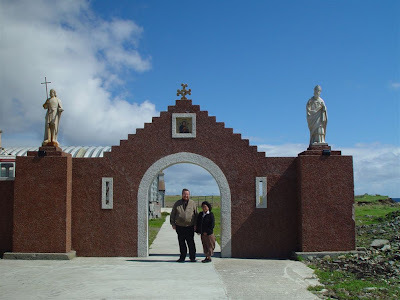 Here Mr & Mrs Karlsen from Sweden are pictured in front of the Monastery gate. Mr Karlsen is a SSPX representative in Scandinavia. 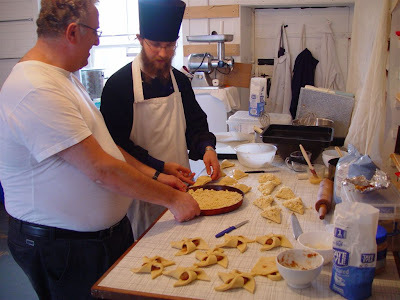 Mr Michael Schneider from Baden Baden, Germany teaches Br Roman some culinary secrets. Mr Michael Schneider and Klaus Kohler.